when in 1995 the portraits of Jānis Čakste, Gustavs Zemgals, Alberts Kviesis and Kārlis Ulmanis, painted by Roberts Muzis, were displayed in the Hall of The Coat of Arms. "This is a part of national history, every individual personality stands for a whole era of state and society. Therefore, it is very good that this international tradition continues in the castle of Riga," the art historian, Imants Lancmanis adds. Later on, the paintings of Guntis Ulmanis un Vaira Vīķe-Freiberga, made by Miervaldis Polis, were added to the gallery. As of April this year, it was revealed that the commission of the portrait of Valdis Zatlers will be awarded to Ritums Ivanovs. "Portraiture interests me from altogether different aspects," Mr. Ivanovs says. 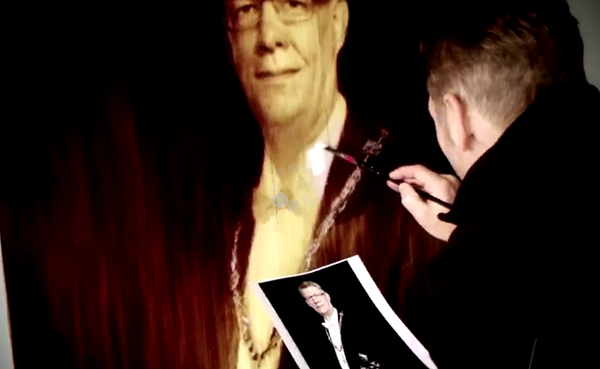 While working with the official portrait of the Latvian ex-president, Ivanovs returned to classical oil painting and created the portrait according to the criteria of parade portraits. 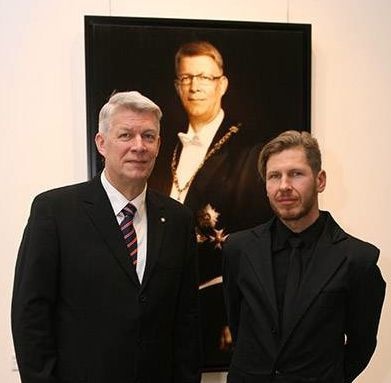 "It fully follows the rules chosen by the Chancery of the President of Latvia and continues with the style found by Miervaldis Polis when depicting previous presidents in official portraits," the Riga Gallery informs us before the exhibition "Public and Private". "I am astonished by the fact that an Ivanovs piece does not show its characteristic stripes," Imants Lancmanis commented. He claims that the artist can achieve great similarity with the depicted subject using his usual style, and that the work mastered in that style would fit well in the contemporary gallery. When recalling the restrictions set in Lancmanis' time when ordering the first portraits of Latvia's ex-presidents, he said, "At that time, it was the request of the commission that they would not step out of certain imaginary limits and would apply coloring that was distanced. I think those requirements were justified, because the four portraits fit the gallery and form a whole. At that time, it was a matter of style and mood, but when continuing with the gallery, each artist can work following his usual methods". "This kind of official art should be perceived very carefully, and the institutions and their representatives in that field should be treated with special care," said art critic Vilnis Vējš on the commissions of ex-presidents' portraits. He considers the tradition to be a bit theatrical, and sees it as a sign of duplicity rooted in official art of the Ulmanis (PM and head of state) and the Soviet era. Mr. Vējš thinks the topical discussions are merely pseudo-criticisms that are being created for one's own benefit. As far as commissions and their set requirements, he says that they should only judge an artists competency within their chosen medium. Further examination of an artists work should not be allowed, since this would continue the worst traditions of authoritarianism judgement of prior Latvian art. "I am actually against such a feeding process that creates something unnecessary, but a bit profitable for all, the processes that have the financial means the real creative processes do not have, that's the most important thing," Vilnis Vējš emphasizes. "In addition, it is quite sad that even people from the field of culture participate in all of this this. They sit within commissions and make decisions, e.g. the coins' design commission in Latvian Bank. This is a pure example of conjuncture and cooperation with power." Discussing commissions, Ritums Ivanovs admits he has always followed the developments of depicting those in the exercise of authority. He points out that nowadays a parade portrait has its niche, which does not always fall into the boundaries of established portraiture. "As we know from history, very many official portraits fall into the field of art, but today these interests are split. Also, the criteria of the commissioners is different than it used to be."